Power button: Turns the phone off or on; found on top of the phone. Speaker: Makes noise, especially during solemn, ceremonial moments when you forget to turn the Droid off. Volume buttons: You adjust the phone’s volume by using the Volume button on the phone’s right side. 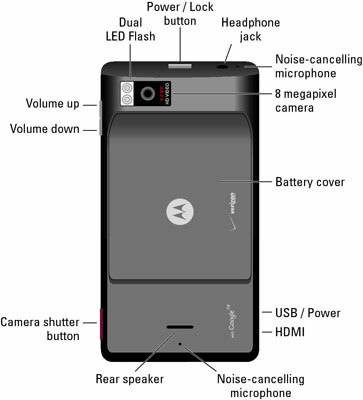 The Volume buttons also serve as a Zoom function when using the Droid X as a camera. Touchscreen display: The main part of the phone. You use the touchscreen with one or more of your fingers to control the phone (which is where it gets the name touchscreen). The Droid X lacks a physical keyboard. Instead, you use an onscreen keyboard that appears on the touchscreen. Camera shutter button: Press it to take a picture with your Droid. 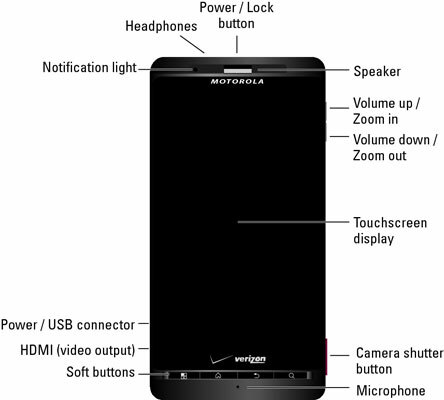 Main microphone: Yes, the main microphone is on the bottom of the phone. Even so, it still picks up your voice, loud and clear. You don’t need to hold the phone at an angle for the bottom microphone to work. Soft buttons: These are some of the most common actions you’ll need to do, so they’re always available. They appear below the touch screen and have no function unless the phone is turned on. HDMI (video output): This High-Definition Multimedia Interface lets your iPhone communicate with an HDTV. USB connector: Use this jack to connect your phone to a computer or to the charger.. Notification light: As the phone charges, the notification light on the phone’s front side lights up. When the light is orange-yellow, the phone is charging. When the light is green, the phone is fully charged..
Headphone jack: When you bought your iPhone, the store might have thrown in a free pair of earbud headphones. Or maybe they didn’t and you had to buy a pair. Either way, this is where you plug them in. Noise-cancelling microphones: Help reduce background noise, which means that you hear people on the phone more clearly, and they hear you more clearly. You don’t speak into the noise-cancelling microphones. Camera: Point this at loved ones, oblivious morons, and accidents (hopefully not all at once) to snap a photo. Battery cover: After you set up your phone the first time, you’ll rarely need to remove this cover. Rear speaker: Designed for video and other audio playback.